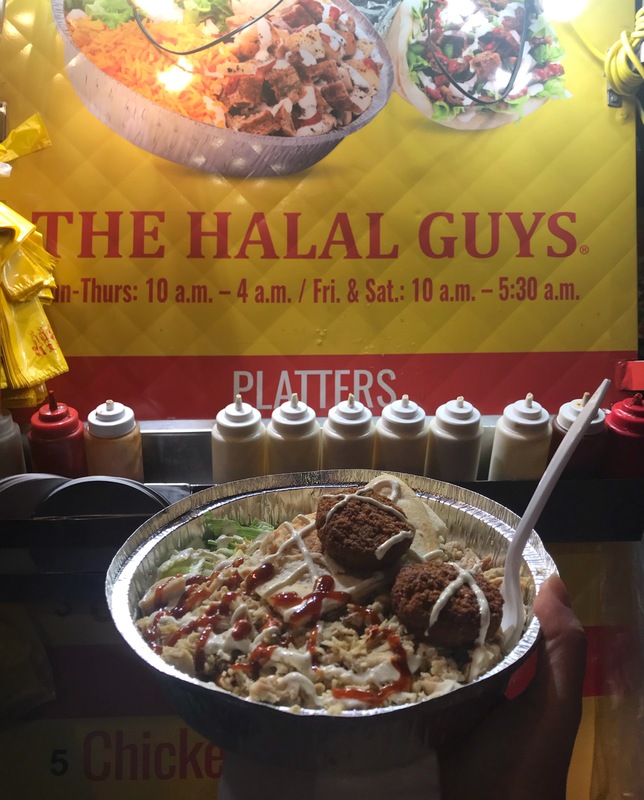 We made it to New York Friday night and we knew what our first stop would be: The Halal Guys on 53rd and 6th ave. If you haven’t tried this delicacy, make sure to include it in your bucket list for your next trip to New York (or if you live in South Florida, great news – they have a location in Davie!). 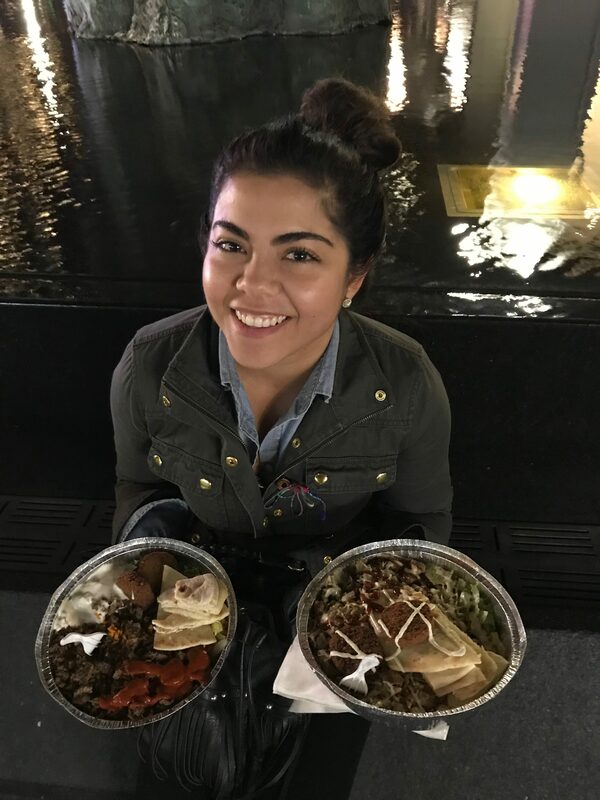 The famous food cart has multiplied to multiple locations around the city and it’s unique flavor and sauces are amazing, delicious, unforgettable…which is why locals and tourists alike are willing to stay in line for the exquisite gyros and platters. 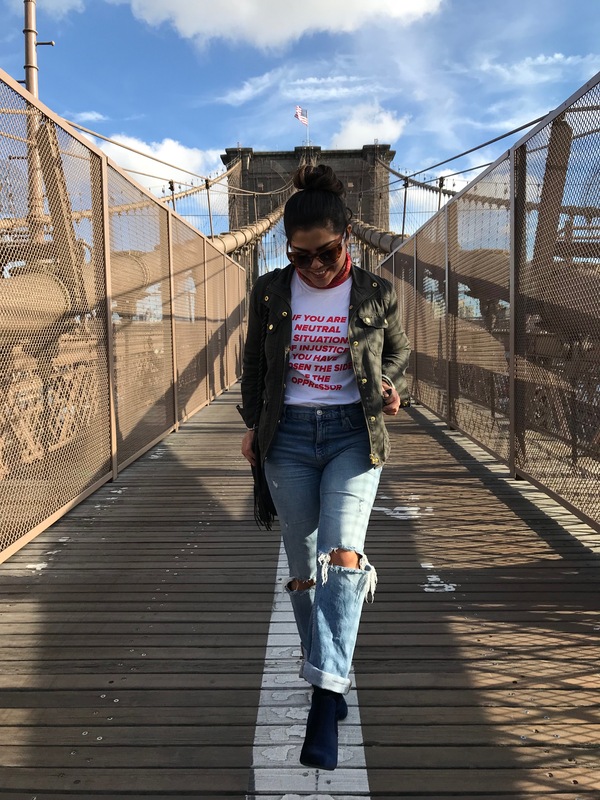 On Saturday we headed to the Brooklyn bridge. The multicultural experience there was exactly what you would expect; people from all over the world posing to get their best picture for Instagram… myself included. It was a funny contrast to see the local New Yorkers who kept a fast pace and didn’t hesitate to yell at people who were posing on — and blocking– the bike lane lol. 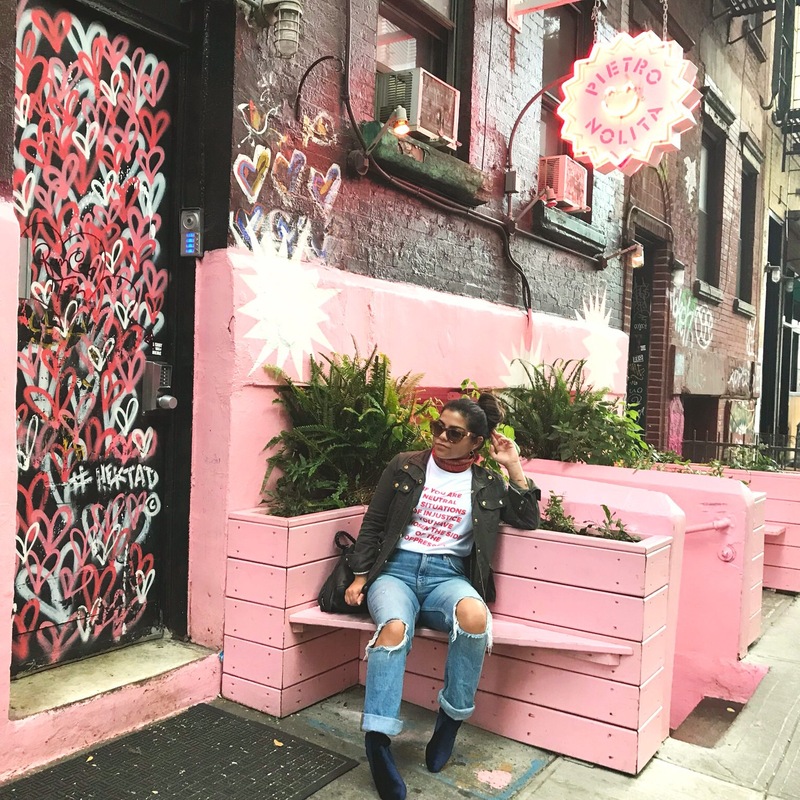 We also visited the Nolita neighborhood and I fell in love with every single corner of that area. If you’re not familiar with the neighborhood, Nolita means “North of Little Italy”. It’s bounded on the north by Houston Street, on the east by the Bowery, on the south roughly by Broome Street, and on the west by Lafayette Street (thanks Wikipedia). 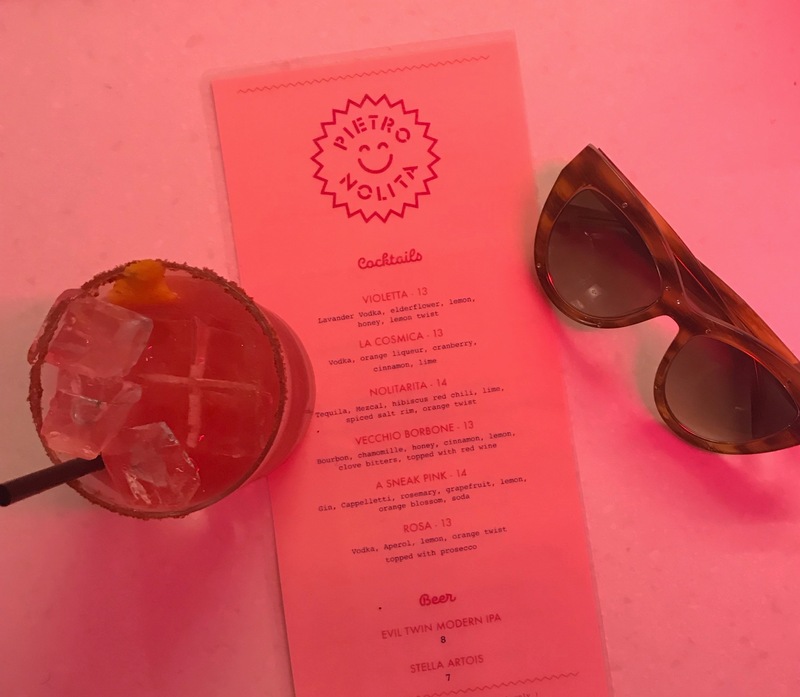 My all-time favorite spot was Pietro Nolita; a tiny, pink, Italian restaurant. 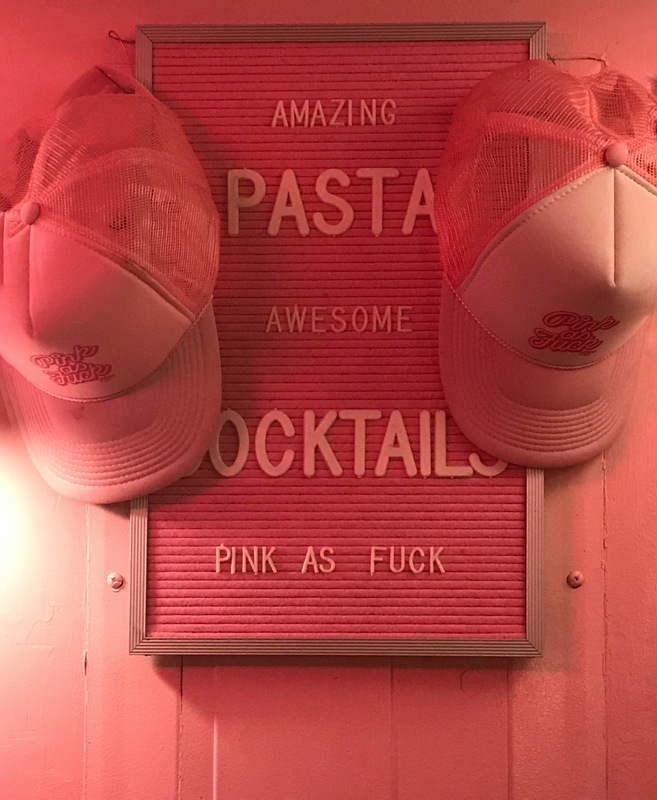 Yes, you read that right, pink or “Pink as F*ck” as a sign over their bar says. We had delicious pink cocktails and had a great time with the eastern-European bartender who played along with us as we tried guessing the name and release date of every song on their playlist. 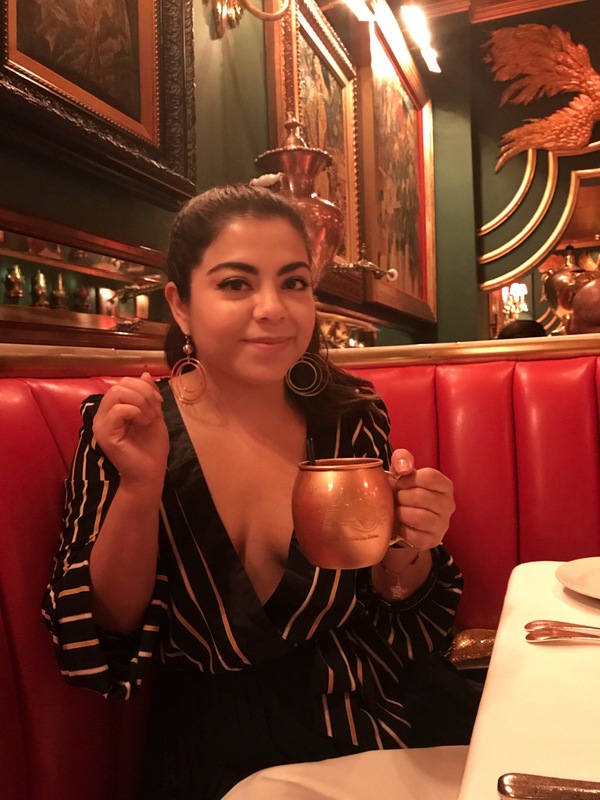 From Latin America we transitioned to Russia as we had dinner plans at the Russian Tea Room. The luxurious decor and the excellent service made me feel like a movie star. The food was delicious as well. 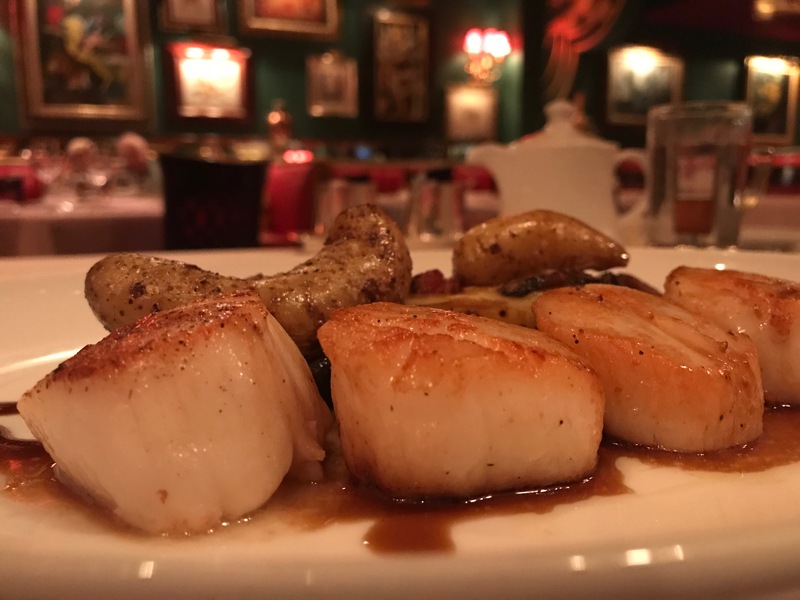 I had scallops that were tender and juicy and a french onion soup that was to die for. I’m salivating just thinking about it. My boyfriend ordered the Boeuf a la Stroganoff and had a vodka martini that came with a a spoonful of caviar. Sunday was all about Harlem. I had had dinner at Red Rooster in Harlem in a previous trip to New York, but a friend recommended that I’d go back for the Gospel Brunch at Ginny’s Supper Club (located on the lower level of Red Rooster). I didn’t need much convincing, so when I booked this trip, this was the first reservation I made. The brunch was buffet style and honestly this wasn’t the best part of the experience, the food was a little cold, but still very tasty. However, the drinks and the show were fantastic. 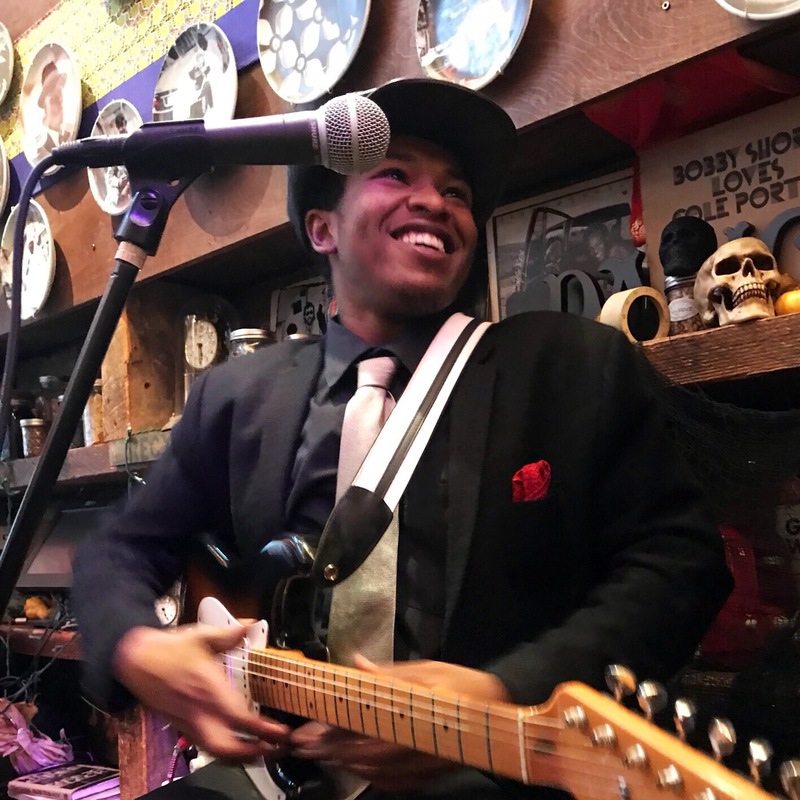 After the gospel show was over, we went upstairs to discover that it was pouring outside, but there was another party inside Red Rooster. We decided to stay at the bar and enjoy the amazing cocktails and live jazz. 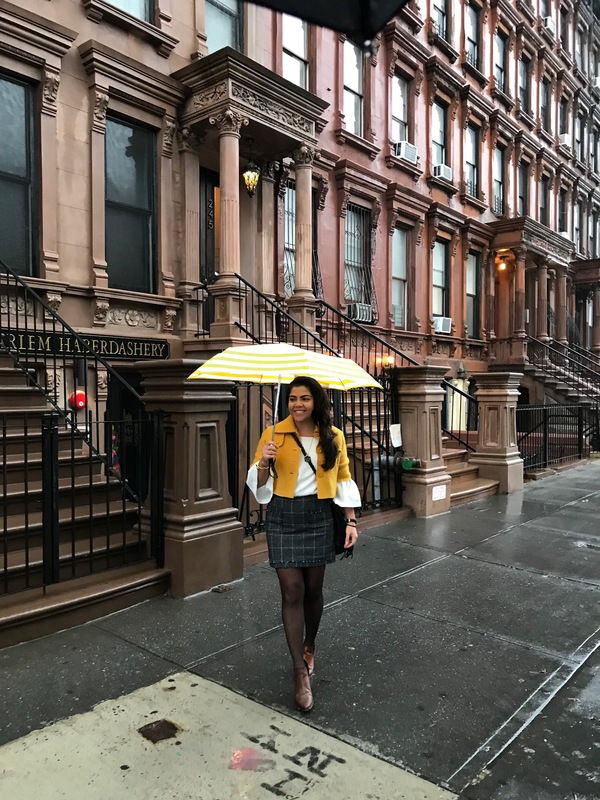 When the music was over and the rain stopped, we walked around Harlem for a bit. We encountered a small museum dedicated to Harlem history, art and culture which was really cool. Later as we walked around some more, we heard more music coming from a building. We rushed inside and realized it was a church and they were celebrating something. I had no idea what that was, but it sounded like a party! People were dancing, clapping and some men were sporting their best orange jackets. We joined the celebration and made some friends. A woman sitting in the back row told us her dad was being recognized, along with the other men wearing the orange jackets, as the best ushers in the neighborhood’s churches. 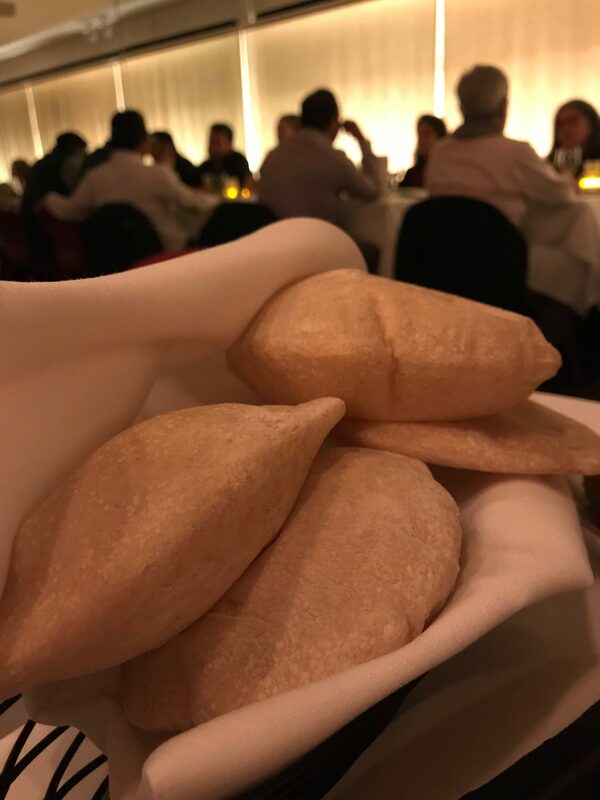 Our trip around the world that weekend ended in the Flatiron District in a Lebanese restaurant called ilili. The menu is inspired by Mediterranean and Lebanese cuisine. 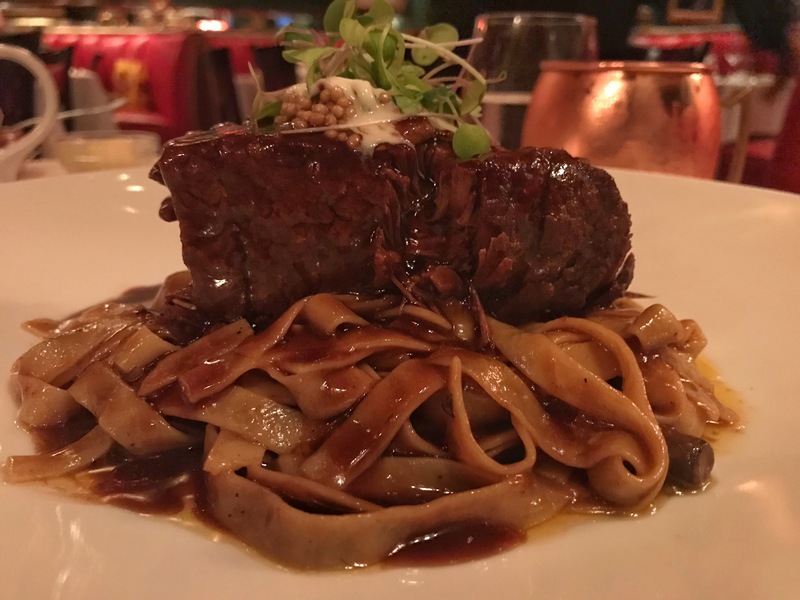 Everything you order is rich in flavor and served in a beautiful presentation. 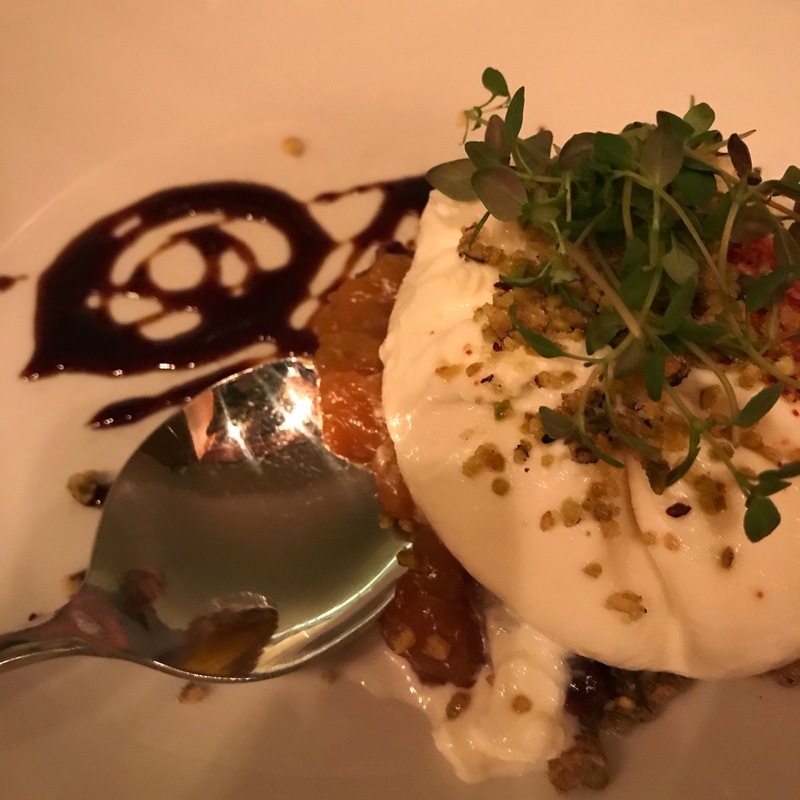 We had a few mezzes including the Burrata, which was served with apricot, pistachio and cherries. We also tried the Kibbehs, a cauliflower dish, another dip made of roasted peppers and a shrimp dish. I can’t forget about the Levantine pita bread! Best. Pita. Bread. Ever. Period. This post ended up being longer than I had anticipated, but I hope you all enjoyed reading it as much as I enjoyed writing it. Let me know your thoughts in the comments. 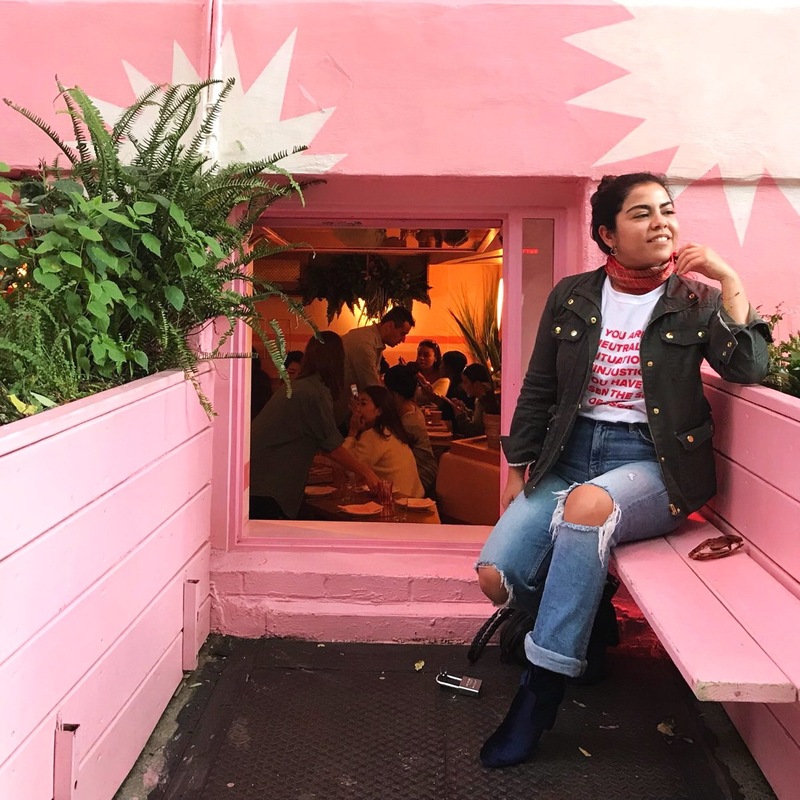 What is your favorite multicultural, international, or foreign spot in NYC? You can read my other post about New York here.